Shetland. Where do I begin? Probably with a huge thank you to Paula and Magnus, with whom we were lucky enough to stay, and their dog Timmy of course. Their organisation of trips, where to go and when, their hospitality and generosity was truly humbling. I say "we" as I was joined by 3 others, Ian, Neil and Kate, and it was called the PINK Tour. Ian and I travelled up on Friday, calling in to Kate's place to take up some of her gear, then taking a leisurely drive for about 8 hours to Aberdeen, where we caught a ferry for an overnight crossing to Lerwick. Waking early the next morning, we peered through the window at the gloom outside, to just about catch a sight of the islands, and it didn't get much clearer as the boat drifted towards the harbour. In the water below were black guillemots and circling the ship were great skuas and gannets. There was some brightness in the gloom though - the flashing headlights of Magnus and Paula's car, as they watched us arrive. A short while later, we had met and were following them back to their lochside cottage. This would be our base for the week, and what a location it was. Overlooking a sea loch, with gannets, fulmars, terns, mergansers and divers flying over, plus curlew and golden plover calling from the moors nearby. Kate and Neil were far more sensible, and chose to fly up! We met them later on the first day at Sumburgh Airport. 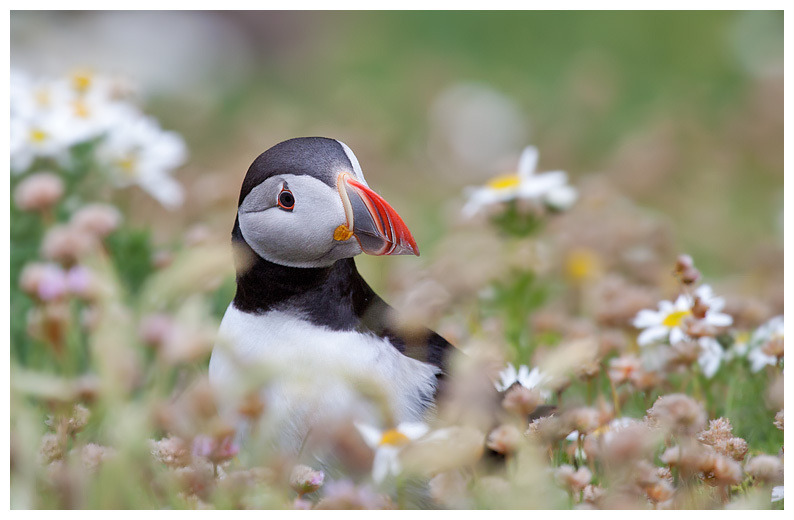 Neil's flight was delayed, so we popped up Sumburgh Head, to view the seabird colony. Here we caught sight of more skuas, including Arctic ones, plus kittiwakes, more fulmars and gannets and a fond favourite, puffins. After collecting Neil, we headed out to Loch Spiggie for a look around, and called into a sandy cove, with turquoise waters. 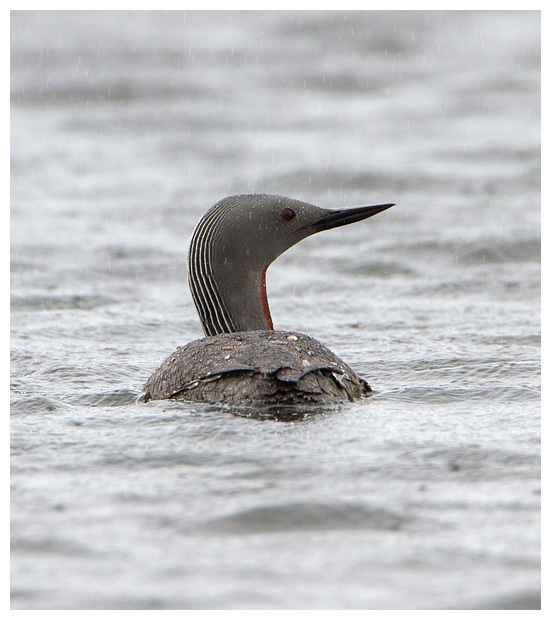 Here I got my first decent views of a red-throated diver as it fished near the shore, and briefly, the sun came out. Back at the cottage, I spent some time down by the water, watching the common and Arctic terns flying, calling and hovering, plus attempted to photo a distant red-throated diver with little success. Nearby were juvenile wheatears and I could hear a local wren calling out. The day ended in fine spirits, with a tasty BBQ at the cottage. Most welcome after a long day. The second day was spent driving around the mainland, visiting historic sites, peering into the gloom, sheltering from the wind and rain, and scoffing chocolate cake in a cafe (Breiwick) with arguably one of the best views in the UK. Kate and Neil battled the elements atop of some cliffs near a lighthouse to get some shots of fulmars riding the gales. And a brief stop beside a loch yielded good views of some Arctic terns, ringed plovers and a fishing puffin. Monday brought a break in the weather, and we opted to head over to Fetlar. This meant catching a couple of car ferries between islands, which allowed us to stand up on deck and view some blue-coloured sea at long last. Fetlar, it struck me, belonged to Bonxies (great skuas) as they seemed to be everywhere. Sat near the road, soaring overhead, chasing other birds over the lochs and sea. 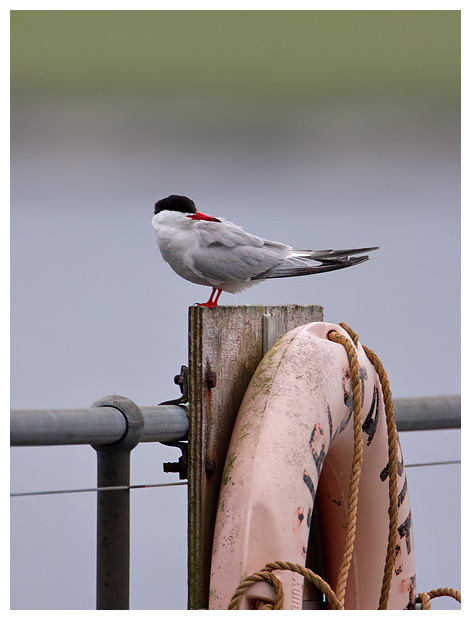 Great to see, unless you're a gannet with a catch! Down by a beach I spotted a few twite, but they vanished before I could grab the camera, and as was becoming the norm, there were divers on the sea. 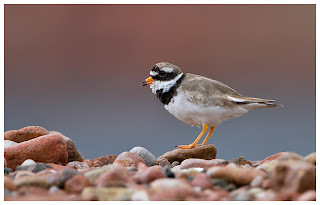 On to Loch Funzie, for one of my target birds, a red necked phalarope. Also on the loch was a pair of nesting red throated divers, and we were able to get fantastic views of the nesting bird. No photos, as I've not got a licence... but I didn't need to, as the partner was gliding around the loch anyway. Not close enough though. In fact the only time it did stray close was when the heavens had opened, and I crouched beside the road, getting soaked. Shots came out ok though, for colourless, rain-affected ones! Also around, and posing for photos, both perched and in flight were Arctic terns. 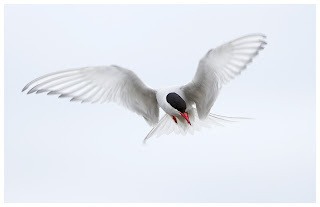 Angelic birds - delicate looking. You would never believe they could fly so far each year. As for the phalaropes? No sign. We hunted high and low, but no joy. There's always another day. 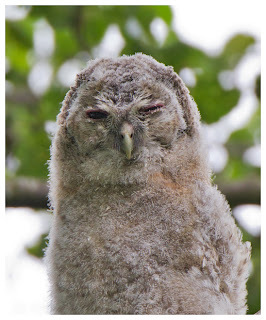 I assume that people who follow this blog like owls, as I do. For any that don't you'd best skip this post! A couple of weeks ago I was fortunate enough to be made aware of a pair of tawny owlets (chicks) on a local reserve, so weather permitting, I headed over for a look. The birds were apparently quite mobile already, and could be anywhere along a line of trees. I had my work cut out, but after about 30 mins of searching, I spotted a shape that didn't quite look like part of a tree. I'd found one. Sat out on a branch, quite high up but already watching me. I expect it had been doing so since I got there, but then I'm a bit easier to see when pottering around carrying my gear! Was a fluffy little character. Not sure whether I'd call it cute? 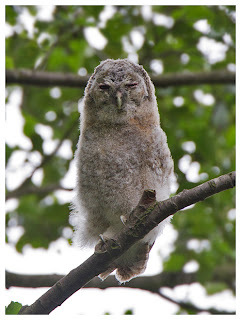 As the breeze moved the branch it was perched upon, the owlet kept its head dead still, to keep a watchful eye on me. Amusing to watch, though being backlit, it didn't make it easy to get a sharp shot. Thank goodness for large memory cards, that's what I say, and after reeling off a few shots at different settings, I managed to get some keepers. I have to say, after looking at the bird's face close up (cropping) it sort of resembles Max!! Sorry mate! 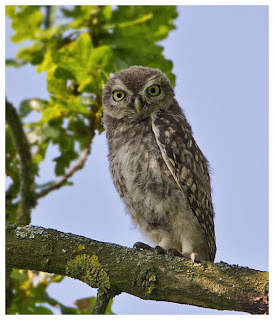 With a bit of decent weather this week, Dad has been popping out locally to see what he can photograph, and I was rather envious when he dropped some photos into my lap, of a little owlet he'd seen at Little Grump's residence. 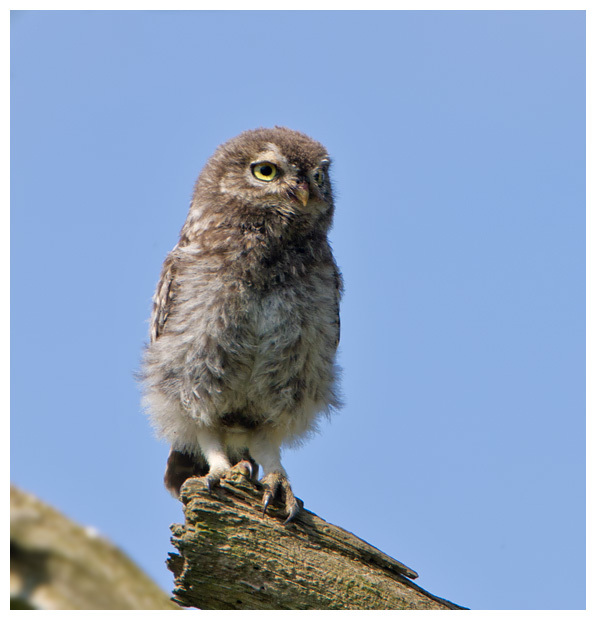 I think it was later in July last year when I saw the chicks, but this was great to see, and meant I had my weekend sorted for more owlet action! But before I could do anything, in the shower on Saturday morning, simply raising my arms to wash my hair, put my back into spasm. I must be getting old! It was (and still is) very painful, so I've been really careful not to exert myself at all since. Hence being sat in a car, having to be motionless, proved to be quite handy! There are two owlets at the site, and both are already mobile. They are so much fun to observe, when they move that is... which isn't that often. They can both fly, and seem to enjoy scampering around the tree, leaping between branches. They also practise bobbing their heads up and down, or around in circles, like they're listening to some disco tunes. The parent birds are around, but they seem to tire of the screeches for food, and fly off to neighbouring trees! 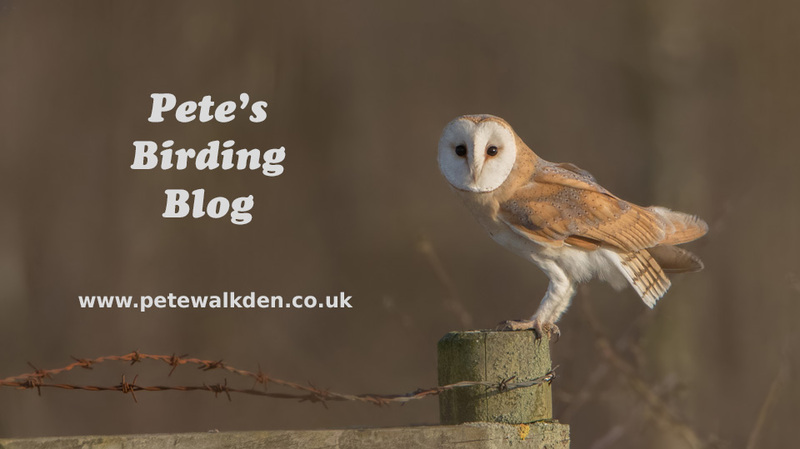 I went both days of the weekend, though total viewing time of the owls must have been about 20 mins. And even then, most of my shots were partially obcsured by leaves or branches, though on a couple of instances the owlets, when possibly too excited from being mobile, forgot to keep hidden, and landed out in the open at the ends of the branches. They soon realised how exposed they were, and dived back into the foliage once more. 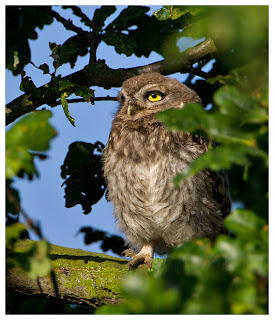 Great to see that Little Grump is keeping the population of little owls going in the area. Just need to get up early enough to work out where some of his offspring have gone to.